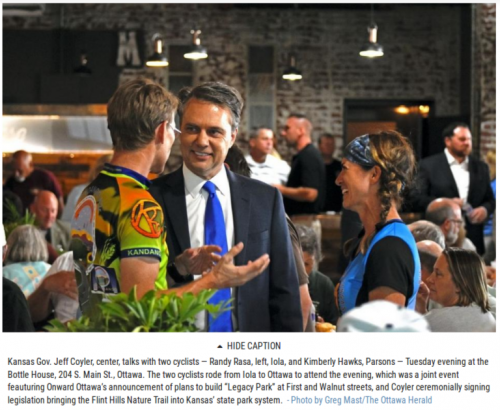 On June 19th, in Ottawa, Kansas Governor Jeff Colyer ceremonially signed legislation designating the Flint Hills Nature Trail as a Kansas State Park. I was on hand for the event, which also previewed a new Trail-Oriented Development at the intersection of the Prairie Spirit Trail and Flint Hills Nature Trail. “Legacy Square” will feature a large covered outdoor event space, as well as amenities for trail users. Note: Some sources report the official name of the new state park as the “Flint Hills Trail”, while others continue to use the “Flint Hills Nature Trail” name … so it remains to be seen what the new park will be called.